Philomena is a marvellous film, one which tells an important story, and in doing so arouses laughter, anger, and sadness in roughly equal measure, but never leaving the viewers feeling that their emotions are being toyed with. In a series of flashbacks at the start of the film we learn that Philomena (Judi Dench), as a young Catholic girl in Ireland, conceived a child out of wedlock and was taken in by nuns at the Sean Ross Abbey in Roscrea. Along with other girls in a similar situation she has to pay for her stay by working in the laundry. We learn that these vulnerable young women are persuaded by the nuns to sign a contract whereby their children will be given to married couples who are able to give them a good home. In fact, the nuns are making a profit by selling the children to wealthy Americans. The day comes when Philomena’s son is taken, and she is absolutely distraught. Several decades later, Philomena is still tormented by thoughts of what has become of her child. On several occasions she has been back to the abbey to find information about her son, but despite providing tea and sympathy the nuns always insist they have not been able to trace the child. 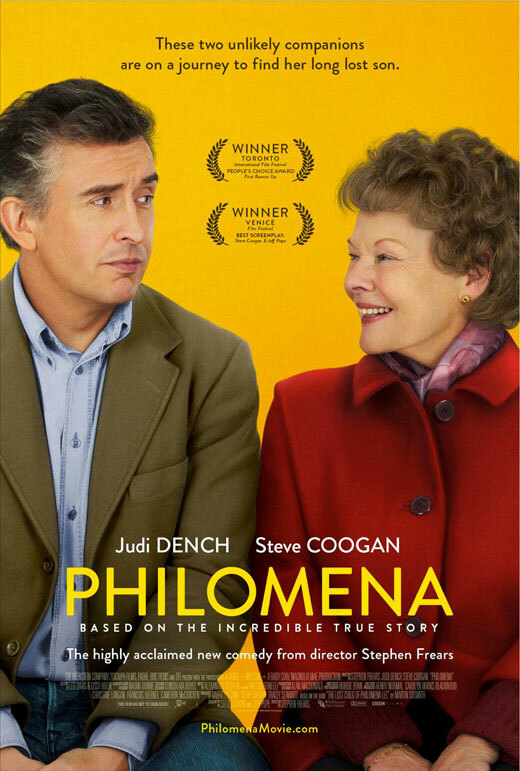 Philomena’s daughter puts her in touch with Martin Sixmith (Steve Coogan), the journalist and former adviser to the Labour government, who had been forced to resign in controversial circumstances and who is at something of a loose end. Working together, they finally uncover the truth. Philomena is, in fact, an odd couple road trip movie. Sixsmith is portrayed as slightly snobbish and cynical, and is initially reluctant to assist Philomena because of his disdain for human interest stories (they are for “weak-minded people”). Philomena, on the other hand, is depicted as working-class, rather naive, and with populist tastes (she loves bodice-ripper romances). Coogan, whose comedy career has largely specialised in depicting oddballs and uncomfortable situations, is at his element in his interactions with Dench. At one point, as they are driving along a country road, Philomena proffers a packet of throat lozenges and asks “Would you like a tune?”, to which Sixmith responds “If you hum it, I’ll play it”. She misses the joke entirely, and holds the lozenges closer, repeating her offer. Further along the journey Philomena responds with raucous laughter when Sixmith says something personal and serious. This clash of worlds occurs again later, in an American hotel breakfast bar. Philomena is thrilled at the range of free food on offer and keeps trying to tempt the well-travelled Sixmith, who is not hungry and for whom such culinary experiences are nothing new. In real life, Coogan is not only an atheist from a Catholic background, but is a victim in the phone-hacking scandal, a witness at the Leveson inquiry, and a campaigner for press regulation. i wonder how much of this was on his mind when he decided to take on the role of a journalist investigating a Catholic scandal. Was he trying to work through his feelings about both Catholicism and journalism? However, Coogan’s own acting is restrained and generous, allowing Judi Dench to come to the fore brilliantly in depicting the tragedy and humour of her own character. Like all road trip movies, the way the two characters develop over the course of the story, and what they learn about themselves and each other, turns out to be as important as the achievement of their goal.